The two new bulls, Kahle and Mvula, have spent their first weeks exploring their new home at Samara Private Game Reserve. Separate at first, it took them a week to settle in and eventually meet up. They have spent most of their time together since then. 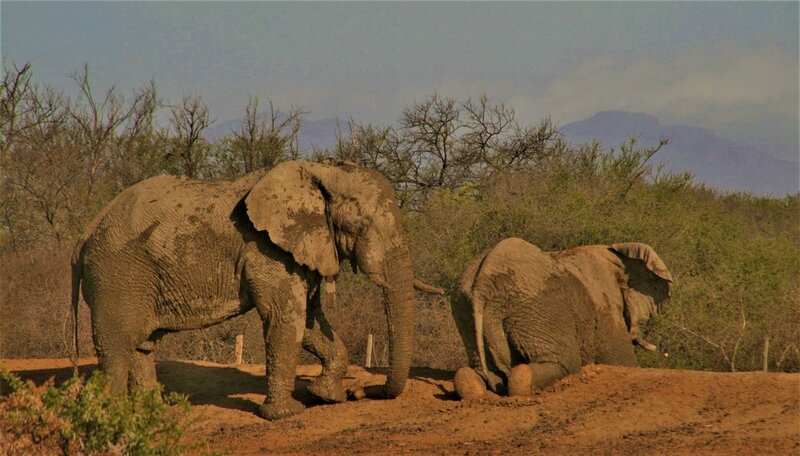 As for the group of female elephants at Samara Private Game reserve, they had not seen or heard any bulls for a year. Naturally, everyone was excited to see how the elusive female elephants would react to having elephant bull in their area again. Kahle and Mvula were released on the western side of the reserve. But they seem to have settled on the eastern side, in an area with dense vegetation on the valley floor below the mountain known by the locals as Mark’s Pass. Here, they have plenty of delicious vegetation in the Cabbage trees (Cussonia spicata) and Jacket plums (Pappea capensis) and waterholes close by for drinking and bathing. Nombeko and her family on the other hand prefer the mountain slopes. During the past year, these females have become quite the accomplished mountain climbers, spending most of their time on the mountain. Although the slopes can be steep, they are covered in Cabbage trees and Spekbooms (Portulacaria afra). There has been a few times where we thought that Kahle and Mvula had met up with Nombeko and the others. The first time was in the first few days after the bulls were released. Late at night watching the updates coming in, it looked like the collars on Kahle and Nomvula were both heading to the same dam. But the GPS showed Nomvula changing direction shortly before ‘making first contact’. A near-miss. Then in mid-December and early January it looked like it might have happened. But we cannot be sure. All the “maybe”-encounters happened during the night with no curious onlookers around. Late January we got proof that all the elephants at Samara have finally meet each other. Penny and her trainee, Mzi, have been following and observing the bulls since they arrived. And one day, they found Kahle with Nombeko and the other females. They seemed to have met in the middle, on the lower slopes of the mountain. Mzi was instantly convinced that one of the bulls had joined the female group. It took Penny a bit longer to be persuaded. As always, Penny was very thoroughly going through Kahle’s different characteristics and checking them on the elephant that she could see in the distance. As he moved through the trees and shrubs, she got a better view of him and concluded that it was Kahle with the females. He was not in the middle of the family group, but rather feeding alongside them in their vicinity. A cautious move considering the skittish nature of the female elephants. Mvula was nowhere to be seen. Both Penny and Mzi scanned the mountain slopes around the elephants, but found no sign of Mvula. It can be very difficult to spot an elephant, when you are far away on a densely vegetated mountain side. It requires eyes like an eagle, patience and a great deal of luck to be looking in the exact spot where the elephant becomes visible in the green sea of trees and shrubs. Kahle eventually left Nombeko and the others and went in the direction of one of the dams. Penny and Mzi went around to meet him there. After he had been drinking for about 15 minutes, Mvula showed up. We do not know where he had been. It seems likely that he had been in the same area as the others, but maybe just further away from them. Anything could have transpired, when the two bulls first made contact with Nombeko and the other females. Albeit we could have learned a lot from witnessing the initial meeting, it appears they are off to a good start. Watch the video taken earlier this year of Kahle and Mvula with the female group at one of Samara’s dams. 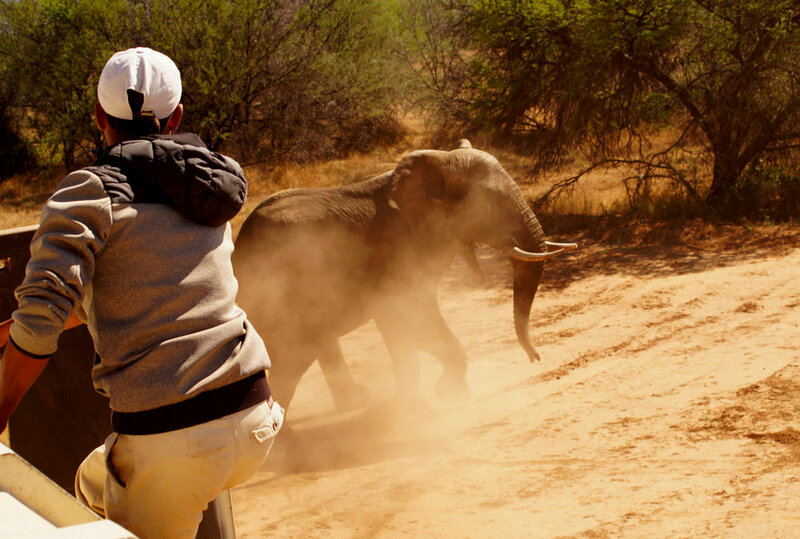 The video was taken by one of Samara’s guides, Julius Mkhize. 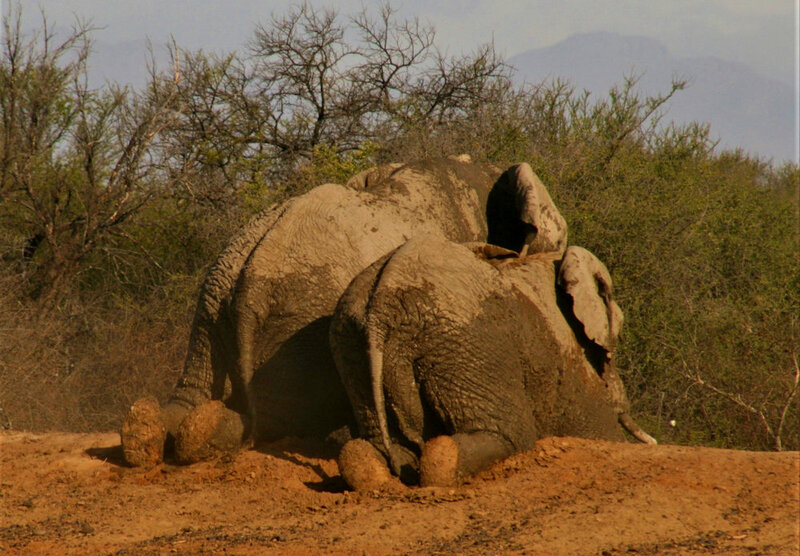 After releasing Kahle and Mvula on Samara Private Game Reserve, we left them alone. Considering what they had just been through, humans were probably not high on their list of favourite things for a while. The ERP Team (Dereck, Daviid, Penny and Ida) took the opportunity to eat a proper meal, have a shower and get a bit of sleep. Some more than others. Dereck and Daviid were left to sleep, as they had carried most of the burden on the road. Ida and Penny took turns. One sleeping while the other monitored Kahle’s movements on the app. We had intentionally set the updates to every 30 minutes to be able to keep a close eye on him. If the bulls decided to try to return home, we wanted to be ready to respond quickly. The next morning, we were up before dawn, heading to the area that Kahle was in. He had crossed the width of the reserve and had finally stopped at the perimeter fence, moving up and down the fence throughout the night. We did not want to disturb either of the two. But we needed to locate Mvula, who did not have a collar on, which meant we had no opportunity to track him remotely via the app. And he might be with Kahle. On our way to the area, we happened to come across one of the female cheetahs and her cubs. A sight such as this is a rare one that should be savoured. We stopped, got out and approached them carefully. The cheetahs at Samara are accustomed to having people on foot, and did not change their behaviour just because people were now watching them. Watching the cubs climb a tree one by one and then disappearing in the bush, tailing their mother out of sight was delightful. Back on the vehicle, we continued the search for Kahle and Mvula. Tracks along the fence told us that at least one elephant had been walking up and down this stretch. As we drove down the fence, we finally spotted Kahle, about 40-50 meters from us. He was walking calmly away from us, glancing back over his shoulder at us. But Mvula was not with him. Happy that we had seen Kahle and that he seemed well, we now searched for Mvula. We went to the area where the female elephants were, hoping that Mvula had joined them. The females were far up on the mountain slopes. But there was no sign of Mvula. He was somewhere else on the reserve. With just under 13,000 hectares there were a lot of possibilities for Mvula to hide. While driving back in the direction of the release site, we spotted elephant tracks along another part of the reserve’s fence. Mvula’s tracks. These were heading south of where we had found Kahle. We asked the reserve staff to check along the fence line to see if there were any breaks. Just in case. The bulls had not broken fences at Phinda, their previous reserve, but there is no way of knowing how elephants will react to a translocation. Breaking fences to walk home is not an uncommen reaction. When the news came in that the fence was intact, it confirmed our expectations that these two bulls were not fence-breaking elephants and that they just needed a bit of time to settle in, before they started exploring their new home. The following morning we went out again. We headed straight for Kahle. He was in the same general area as the night before, but in much denser vegetation. It was so thick that we would not be able to see him, even if he was just 15 meters from us. We got out of the car and climbed up on the mountain side to get a better view of the area. When we could not spot him through the binoculars, we deployed the drone. Even with the drone, the vegetation was too dense for us to spot him from above. Moments later Penny spotted him, or rather the dust he was spraying. In the distance, up on a ridge a cloud of dust blew in the wind - like a whale exhaling but in a sea of deep green instead of blue. That was all we could see of him. Along the way we happened to come across Pokkie, trainer at the SAT Tracker Academy on Samara, out with with his students following tracks and signs in the bush. Penny asked them to keep an eye out for Mvula and his tracks and if they would let us know if they saw anything. Dereck, Daviid and Ida had to go back to Pretoria. Penny stayed to continue monitoring all the elephants, particularly Kahle and Mvula. Penny found Mvula the next day with help from Samara’s rangers and the Tracker Academy that had seen signs of him in the southern section of the reserve. The younger of the two bulls had taken up residence in the riverine thicket, feeding on the lush vegetation there. In the following days Penny continued to monitor the two bulls and the group of females. On the 25th of November, we got happy news. Kahle and Mvula had finally met up. They were walking and feeding together, and seemed to have settled in at their new home. Now everyone wanted to see Kahle and Mvula join Nombeko and her family. With the permits in hand, the ERP team headed off from Pretoria on Friday the 17th of November 2018. Dereck, Ida and Daviid were driving to Phinda Private Game Reserve, near Hluhluwe in KwaZulu-Natal, where they would meet up with the last member of the team, Penny. After a 6-hours drive, we finally arrived at the warm, lush Phinda. Last minute logistics were sorted out. The assigned meeting place for the following morning was confirmed. The capture, the drive with the elephants, and what to expect was discussed during a well-deserved dinner. Anticipation and nervousness slowly started to make an appearance. The next morning, we were all up before the sun and ready for the day to come. We were joined by the owner of Samara Private Game Reserve, Sarah Tompkins, and her two guests. The tension and excitement that had started the night before increased as we drove through the reserve accompanied by the rising sun. Arriving we met up with Simon Naylor and his reserve team, as well as Kester Vickery and his team. Everything was ready. The wake-up box had already been built the day before and the flatbed truck to transport the elephants stood ready to go. All we needed was the air to warm up enough for the helicopter to take off. Only one of the two bulls required had been decided on beforehand - Kahle (Zulu for gentle), an elephant bull about 35 years old, who was often seen in the company of a few different younger bulls. The plan was to find one of these younger bulls first. It would not be difficult to find Kahle - he had been collared two months prior to the translocation. As soon as the air had warmed up enough, the helicopter and the vet were off to search for elephant bulls. It did not take long for the radio to come alive with scratches and voices from the helicopter. A bull had been located. Everyone jumped into their assigned vehicles. The ERP team on the back of capture vehicles. Guests on the game viewer. And off we went. It was not far to where the first elephant bull had been darted. Unfortunately, he had fallen on a bit of an incline with his head resting downwards. The team was quick to get straps around him and pull him to a better angle. At the same time, Ida and Penny were darting around the elephant getting as many measurements as possible, before the elephant was hoisted into the air and placed on the flatbed truck. As the flatbed truck drove away with a huge elephant on it, one of Phinda’s rangers told us a bit about him. His name was Mvula (Zulu for rain) and he was about 20 years old. 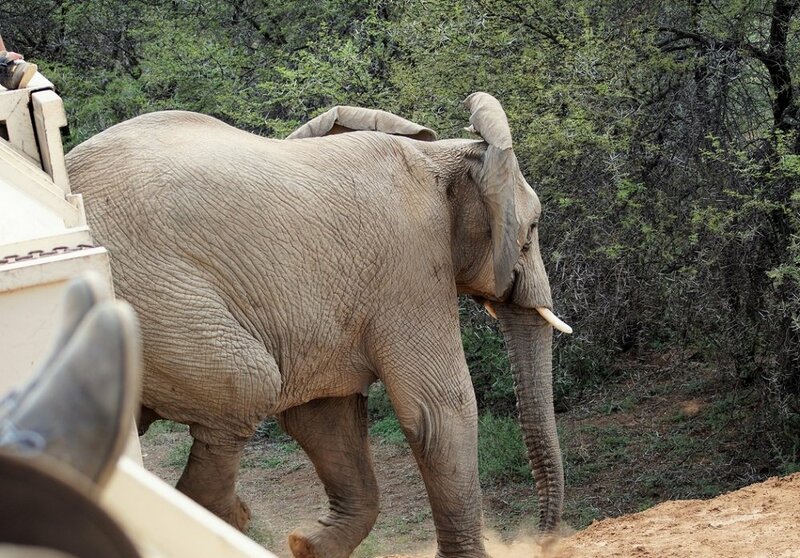 The ranger told us that Mvula was an easy-going elephant and relaxed around vehicles. After a few moments to collect ourselves, we were off again. They had found Kahle. Arriving in the general area, we were told to standby. Kahle was not happy with being darted again and he was fighting the drugs and running away, more or less in our general direction. Standing on the bed of a capture truck, we saw Kahle in amongst the trees, running straight for us and turning when he saw us, fleeing into dense vegetation, where he finally went down. Bouncing through the bush, ducking from thorny branches and holding on for dear life in bends and turns, we arrived where Kahle had gone down. 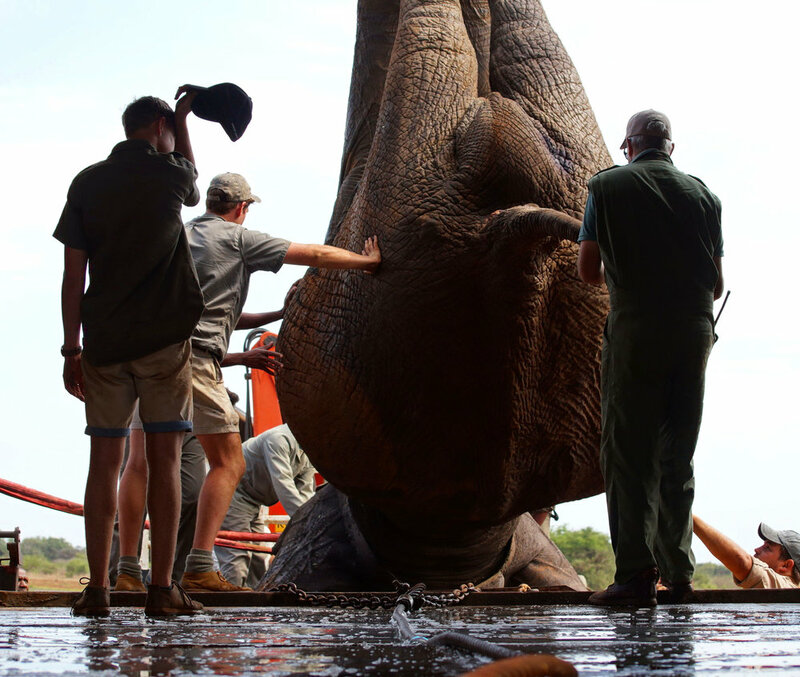 As the vehicle stopped, we hit the ground running to get the measurements done in that little window of time between the elephant having been sedated to him being hoisted up on the flatbed truck. Before anyone knew it, it was done. All the measurements had been taken, a couple of scratches had been treated, and Kahle was on the flatbed on his way to the wake-up crate. When we arrived, Mvula was already awake and ready in his transportation crate. Kahle was moved into the wake-up crate on a conveyor belt and woken up. It took him a bit of time to wake up and get up, before he reversed into his transportation crate. And then the translocation truck carrying the precious cargo of two gigantic elephant bulls was off. Ahead was a 1,400-km journey that would take 24 hours. After a quick shower back at the lodge, the ERP team followed. 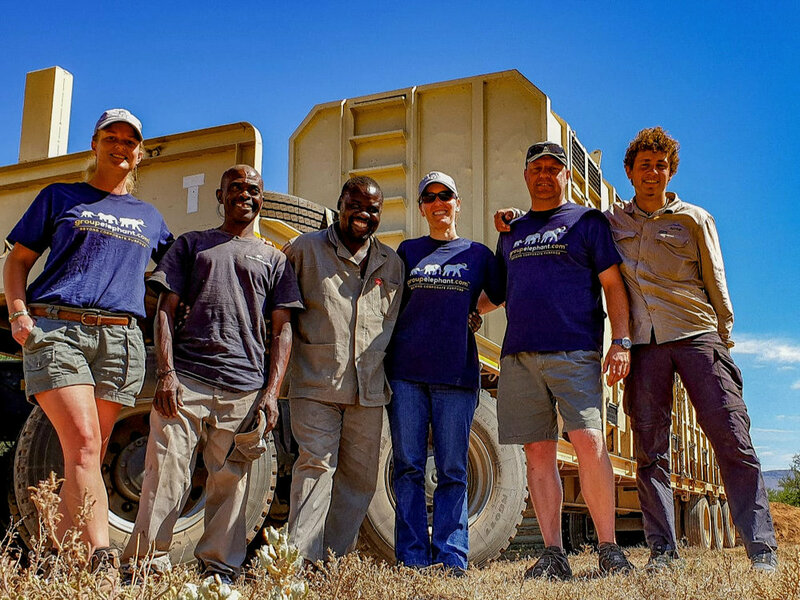 We would function as support for the two drivers from Conservation Solutions, Koos and Skukuza. Anything they needed during the drive, we would help with, whether it was help at toll gates or weighbridges, food and beverages on route or breakdowns. When you are driving for 24 hours non-stop, you need a good team. It is also a great opportunity to get to know each other. You see how the others react under pressure, from sleep deprivation, from being hungry, from being anxious about how the elephants were doing in the truck. Discussions and conversations on a wide variety of topics were interspersed with jokes and laughter and bouts of napping or just resting of eyes. Sunday morning the sun rose behind the mountains of Eastern Cape. A beautiful backdrop to the transportation truck driving past us, just north of Graaff-Reinet, the nearest town to Samara. Driving ahead of the truck, we reached the gates to the reserve where staff was waiting to let us in. We continued in front of the truck to make sure that everything was ready at the offloading ramp. Here, staff from Samara stood ready with support vehicles, a tractor and a few lucky guests who had not known that they would be present for such a unique experience when they booked their stay at Samara. As the rumble from the translocation truck could be heard in the distance, the fortunate spectators climbed on the game viewers. Koos expertly reversed the massive translocation truck to the offloading ramp. Ida and Dereck climbed on top of the truck with Marnus Ochse, General Manager at Samara. Skukuza and Koos, seasoned experts in releasing elephants, stood ready at the sliding doors with two rookies - Mzi and Ntsindiso, the two interns that we have been training in elephant monitoring at Samara. When everyone was ready, they pulled the doors open. The first to emerge was Kahle. He pushed the last bit of the sliding door open. As he stepped out, he grabbed a bit of dust and sprayed it, trumpeted and walked out and down the ramp and in between the trees. Mvula was not far behind him, reversing out of the crate calmly before heading off in the same direction as Kahle. Transporting a force of nature, as elephants are, wreaks havoc on the nerves - even for the most experienced of us. So, releasing the elephants in their new home is always a joyous and victorious moment. It was a moment of collective elation, when the gentle giants disappeared into the bush. We were left standing there, feeling the tension of the last 36 hours leaving our bodies. This victorious feeling was then joined by exhaustion, hunger and a dire need of a shower. Check out our next blog post on how Kahle and Mvula have settled in at Samara! We recently completed the translocation of two elephant bulls to Samara Private Game Reserve, aspiring for a viable population of elephants in their former range and ecosystem. This is how it all came to pass… About 20 years ago, on a safari in South Africa, Mark and Sarah Tompkins learnt of the magical Karoo. Soon thereafter they acquired a little piece of this magic place themselves. A bit of land near the town of Graaff-Reinet. With patience, passion and expert advice they started to restore the utilised farmland back to the bush it had once been. As the land improved with rest, they slowly started to restock the area with the species that were once there: black wildebeest, mountain zebra, plains zebra, springbok, and the cheetahs that Samara Private Game Reserve is now famous for. In 2017, Sarah and her daughter Isabelle contacted Dereck to see if we could help them return the largest of the original species, known across Africa as the gentle giants - the African savanna elephant. Palaeontological records show that elephants used to roam in this region. Tusks, bones and teeth have been found in the area. Once again, these stomping grounds were to become inhabited by the gentle giants, that were eradicated from the area some 100 years ago by an influx of hunters wielding firearms and killing for sport. 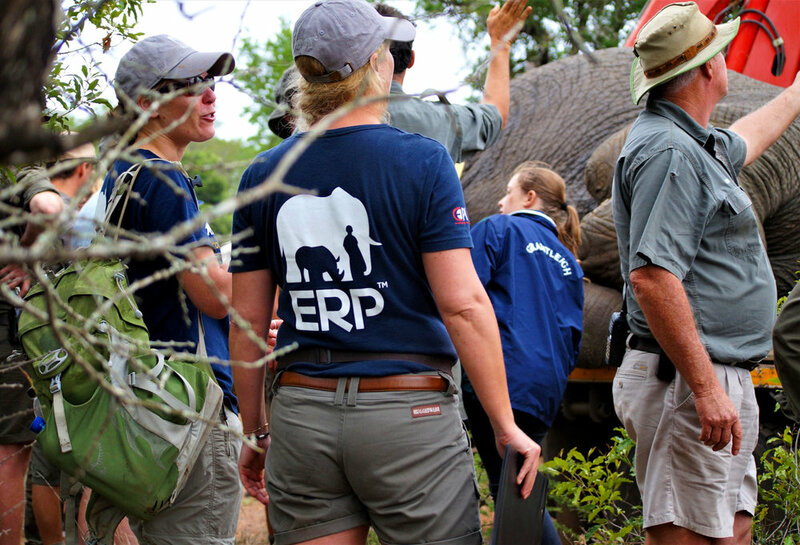 The reintroduction marked the start of the partnership between Samara and ERP. The first part of this relationship was the relocation of a family group of female elephants, known as the N-family, to Samara last year. We have now completed the second part - the relocation of two elephant bulls to Samara. Planning the relocation of the two elephant bulls to Samara was a bit of a struggle. The original elephant management plan at Samara only allowed for the reintroduction of one bull - not two bulls. However, as elephant bulls are a lot more social than people tend to think, ERP encouraged Samara to amend their management plan to allow for two bulls. Sarah and Isabelle worked tirelessly and with determination on this. It also could not just be any elephant bulls. Following the advice of various experts and of ERP, they searched for a mature elephant bull in his mid-30s and a younger male companion. It was important to get two bulls that were of the right ages and were known to associate with each other. After exploring options at different reserves, two suitable bulls were found at Phinda Private Game Reserve in KwaZulu-Natal. Following nerve-racking weeks of permit applications, waiting and frequent phone calls, Ida was sent to the office in Bisho, Eastern Cape, to help speed up the process and get the permit through the last hoops. Samara’s last permit was finally issued on the 8th of November 2018, just in time but with none to spare. With Samara’s permit in hand, all that remained was for Phinda to get their permits approved in KwaZulu-Natal. This was done in record time. A week later, on the 15th of November 2018, Simon Naylor, Reserve Manager at Phinda, got the last necessary permit. This left us with only 24 hours to sort out the final logistical challenges. The elephant bulls were being translocated two days later on Saturday the 17th of November. If the translocation was delayed any further, it would have to be delayed to 2019. It is not responsible to move elephants in the heat of the summer. Part of ERP's task at Samara Private Game Reserve is to teach two interns (Ntsindiso and Mzimasi) about elephants and elephant behaviour. The two interns graduated from the SA College for Tourism Tracker Academy (based on Samara) in December 2017. Now, they are interns at the lodge and help they guides by tracking animals on game drives, while at the same time learning about guiding. It is difficult to track animals on the hard surface of the Karoo, but they have been trained well. The best way to learn about elephants is to be with elephants. And as the elephants at Samara have become mountain elephants that means climbing mountains to get to them. So, Ntsindiso and Mzimasi are coming with me. With us, we have a telemetry to track the collared elephant and a backpack with water, radio, and binoculars. It is not much, but it will be heavy enough during the hike. At the base of the mountain we use the telemetry to get a general indication of where the elephants are and then we start walking. The first bit is not bad. It is fairly flat and relatively open. It is also black rhino habitat, so we are keeping our eyes and ears open for any signs. As we start climbing, it quickly becomes steeper and challenging. Every now and then we stop and get a new reading on the telemetry, making sure that we are still heading in the right direction. Ntsindiso and Mzimasi have only seen elephants a couple of times and never up close. During our climb, before we get too close to the elephants, we talk about elephants. About the social structure, their intelligence, their senses, their strength, their memory, how important it is to treat them with respect. And about how elephants communicate, and that there is a whole new language that Ntsindiso and Mzimasi will have to learn - elephant language. The closer we get to where the elephants are, the fresher the signs of the elephants become. Tracks from early in the morning. Broken off twigs and leaves. Still warm and moist dung. We do not discuss elephants anymore. We walk as silently as possible in the thick vegetation. We snap our fingers to get each other's attention and point and whisper. We end up about 15-20 meters from the closest elephant. We are only seperated by a single line of bushes. The vegetation is so thick that there is no visual of the elephant. We can only make out a bit of movement from a swinging tail and a trunk pulling off leaves. An elephant rumbles not far from us. And another one answers with a rumble. In a whisper I explain that it is the elephants communicating. Ntsindiso shakes his head and says it must be a game viewer on the top of the mountain - where we almost are. When I insist that it is the elephants and another rumble starts, Ntsindiso's face breaks into a delightful smile. And so does mine - the sound of elephant rumbles is always a favourite of mine. The elephants must have heard us approaching. Although we were doing our best to be quiet, we did make noise. They are fairly calm and do not move at first. Only when the wind changes direction and they get our scent, do they move away relatively slowly but determined. We wait, giving them some space before we follow them. Ahead of us we can see a cabbage tree swaying, as branches are being pulled off. As we come around a bush, we get a partial visual of three of the elephants. We stay with them as long as we can without stressing them. Just before midday we leave them. This is the warmest part of the day, and the elephants prefer to rest in peace in the shade of a tree during this time. The first two months they stayed near the river, close to where they were released. Here, they had everything they needed - fresh water, plenty of forage, safety, and shade. They spent the warmest hours of the day resting in the shade of the sweet thorn acacias and peppertrees along the river. In the cooler parts of the day, they went exploring along the river - occasionally venturing further away from their comfort zone. These adventures were relatively short, and they would soon return to the dense vegetation at the river. Now, the elephants have become mountain elephants. From staying in the lowland near the river, they have now ventured up the mountain sides. They have become quite the skillful mountaineers, carving new paths through the dense vegetation and are manoeuvring up and down and along the mountain sides. On the the mountain they have found a natural spring with clean and cool water, some shady resting spots, and a smorgasbord of delicious trees - cabbage trees, spekbooms, jacketplums etc. All of these trees are very palatable to elephants - for them it is possibly the closest things to candy in the veld. The job of an elephant monitor requires observation of elephants. Trying to find them from the base of the mountain using binoculars is not enough. So, the elephant monitor has become a mountaineer as well. Climbing up rolling rocks, navigating through dense vegetation, ducking through bushes, and trying to keep up with the elephants. The elephants move quickly, adeptly, and relatively silently in the mountain. One would think that they have never been anywhere else.